Other than the Vancouver/Memphis Grizzlies, it’s tough to think of a franchise that’s faced more hardship- both as a result of their own doing as well as bad luck- than the Minnesota Timberwolves. In their 21-year history, the Timberwolves have made eight appearances in the postseason, all of them consecutively. However, sandwiching this period of relatively prosperity are two stretches of futility, defined by misfortune, missteps by management (Joe Smith was worth how many first rounders??) and unrealized potential. What’s worse is that it seems like every cause source of optimism for this franchise comes with strings attached. The team’s early years were not atypical of an expansion franchise’s early days- wins were difficult to come by (average 21.7/season; high of 29), the team hit on some draft day selections (Christian Laettner and Isaiah Rider) and missed on others (Felton Spencer and Luc Longley). The problem? Even when they got it “right,” the Wolves wound up with a pair of bad teammates and a budding criminal not-so-mastermind in Rider. The early days of the Timberwolves peaked in 1994, with Isaiah Rider’s spectacular and then-unprecedented “East Bay Funk Dunk” at the slam dunk contest, which took place in Minneapolis’ Target Center. After six difficult seasons to start the 1990s, the Timberwolves managed to reinvent themselves with a single, (at the time) daring draft pick. With the fifth pick in the 1995 draft, the Wolves rolled the dice on a gifted big man that was attempting to become the NBA’s first “preps to pros” star in two decades- Farragut Academy’s Kevin Garnett. The team continued to struggle in Garnett’s rookie season (1995-96), managing just 26 wins, but his emergence in 1996-97 gave the franchise its first (and only, to date) legitimate superstar. In a dozen years in the Twin Cities, Garnett cemented his place as not only the greatest player in Timberwolves’ history, but as one of the greatest power forwards ever to grace an NBA court. After that first, difficult year, KG teamed with a variety of talented supporting players to lead the Timberwolves to eight consecutive playoff appearances- the only postseason trips in franchise history. Ahead of the 1996-97 season, a draft day trade landed PG phenom Stephon Marbury in Minnesota. Optimism was sky-high, with Christian Laettner and talented problem child Isaiah Rider gone, and Garnett now teaming with new-acquired PF Tom Gugliotta and Marbury. The trio initially had the look of a budding powerhouse, leading the Wolves to the postseason in each of Marbury’s first two seasons and producing the Wolves’ first-ever-winning season in1997-98. However, the euphoria and optimism would be short-lived. Rather than teaming up to transform the franchise, petty jealousy over a massive contract extension for Garnett led to the deterioration of Marbury’s relationship with the franchise. He was dealt to New Jersey early in his third season in deal that would bring Terrell Brandon to the team. In three seasons with the Wolves, Brandon picked up where Marbury had left off, teaming with Garnett to lead the Wolves to three more .500+ seasons, the franchise’s first 50-win season and three more playoff appearances. Irrespective of flux at the point, the Timberwolves were now a consistent winner and a perennial playoff team. The problem? First, by 2002, Terrell Brandon’s career had been brought to an abrupt end thanks to injuries. And that’s not even the bad part- in the summer of 2000, the Wolves made an illegal, under-the-table agreement with free agent Joe Smith (Really? You’re gonna break the rules to sign Joe Smith? ), which was voided by the NBA who, upon ruling that the deal violated league procedure, fined the team, suspended GM Kevin McHale for a year and stripped the team of three first round picks (2001, 2002 & 2004). Following Brandon’s retirement the Timberwolves made another pair of playoff appearances- though they still had yet to win a series- before teaming Garnett with Sam Cassell and Latrell Sprewell. This was the best collection of perimeter talent he’d had in his career. The talented trio would produce the franchise’s best-ever season in 2003-04, winning 58 regular season games and advancing to the Western Conference Finals, where they fell to the Lakers in six games. At the time, no one would have guessed that Wolves’ trip to the top-tier of the NBA would be so short-lived. However, this would prove to be a fleeting high water mark from which the Timberwolves have fallen precipitously. In the years that have followed, the Timberwolves have produced just one winning season (44-38 in 2004-05), failed to make the playoffs, elected to trade the only superstar in franchise history rather than risk squandering the remaining years of his prime, and have failed to win more than 24 games in a season since. As an NBA fan who’s rooted for the Wolves in the past and actually married a Minnesotan, I desperately want to paint an optimistic picture of this franchise’s future. However, recent moves by management- namely GM David Kahn’s PG Tourette syndrome in the 2009 draft, the alienation of Ricky Rubio and the decision to trade away the legit 20- 10 big man received in exchange for Garnett for no actual players- have not exactly impressed. Man, was this ever a close race! Taking a close look at the numbers, four strong candidates emerging, each with one “fatal flaw”- or at least the absence of a differentiating strength. In Timberwolves’ history, four PGs- Terrell Brandon, Stephon Marbury, Pooh Richardson and Sam Cassell- have averaged at least 15 ppg and 6 apg. Three of them have run the point for the Wolves in the postseason, and just one (Cassell) has been part of Wolves’ team that’s actually won a playoff series. However, despite his outstanding play for the team, which includes 17.2 ppg, 6.4 apg, an All-Star appearance and teaming with KG to lead the Wolves to the conference finals, Sam Cassell’s case comes up short. He made just one playoff appearance with the team- albeit the best one in franchise history- didn’t dominate the competition here statistically and simply didn’t play enough games in the Twin Cities (130 over two seasons) to claim any kind of “face of the franchise” status. In a similar boat we have a young Stephon Marbury. When he came out of college after just one year and teamed with Kevin Garnett, Marbury looked like the cornerstone of a budding dynasty. In 167 games over 2+ seasons, Marbury averaged 16.9 ppg and an excellent 8.3 apg and as a 20 year-old rookie was the first PG to lead the Wolves to a season of 30+ wins, as well as the playoffs. While he and KG took the Wolves to the postseason in each of Marbury’s first two seasons, they were unable to build on that early success, and thanks to jealousy over money Marbury was shipped out of town just 18 games into his third season. That simply doesn’t happen to guys that talented unless something’s REALLY wrong upstairs. That brings to the first draft pick in franchise history, Jerome “Pooh” Richardson, selected 10th overall out of UCLA in 1989. I realize this is something of a obscure, jokey, “blast from the past” name, but the thing is, this guy was pretty good. Not only was Richardson a solid, productive point guard for his first seven NBA seasons, he looked like an up-and-coming star during his first three in Minnesota. As a rookie in 1989-90, he averaged 11.4 ppg, 6.8 apg and 1.6 spg and was named to the NBA’s All-Rookie First Team. He followed up his solid rookie season with a pair if excellent seasons at the points, averaging 17.1 ppg, 9 apg, 1.6 spg in 1990-91 and 16.5- 8.4- 1.5 in 1991-92. In the summer of 1992, following his third season, Pooh was traded, along with Sam Mitchell, to the Indiana Pacers in exchange for Chuck Person and Micheal Williams. That his teams won a total of just 66 games in three seasons is certainly a mark against him, but it should be that the Timberwolves actually won fewer games in years 4-6 (60) than they did in years 1-3. Statistically, Richardson makes as strong a case as any Wolves PG. He’s still the career leader among Wolves’ PGs in games (246; the most possible in three seasons), points (3,689), FG attempted (3,536), FG made (1,648), assists (1,973), rebounds (1,559) and is second in steals (383; 3 behind Terrell Brandon). In franchise history, only Kevin Garnett has more assists. Pooh Richardson was pretty good! That brings us to Terrell Brandon, the best combination of the aforementioned trio. In terms of individual and team success, as well as tenure with the team, Brandon’s resume makes the most compelling case. He was traded to the Timberwolves midway through an injury plagued 1998-99 season, and played the final 21 games of the regular season and four playoff games with the Wolves. Brandon ranks at or near the top of the rankings of Timberwolves’ PGs in games played (2nd), points (3,157; 2nd), scoring average (3rd), rebounds (2nd), assists (2nd), assists per game (T-1st), steals (386; 1st) and steals per game (1st). In each of his three healthy(-ish) seasons in Minnesota, Brandon helped lead the Timberwolves to a .500-or-better record- including the team’s fist 50-win season in 1999-2000- and the playoffs. That season was one of Brandon’s best in the pros, as he averaged 17.1 ppg and 8.9 apg. In the postseason, Brandon performed up to, or beyond, his already solid numbers, averaging 18 ppg, 6.8 rpg and 7.3 apg in 12 playoff games with the Wolves. Unfortunately Brandon’s time in Minnesota, as well as his career, were sadly cut short, as his constant struggle with injury landed him on injured reserve in February 2002- he would never play another game in the NBA. I can guarantee that there is at least one home in suburban Los Angeles which houses both home and away replica Isaiah Rider Timberwolves’ jerseys. For a good chunk of the 1990s, Isaiah Rider was my favorite NBA player. His exceptional offensive talent, his strength, leaping ability and explosiveness, combined with the post-Magic/pre-Kobe void for Lakers fans (of which I am one), made him an exciting and viable option as the object of my basketball affection. Before his name became synonymous with character issues, Rider was on one of the NBA’s most gifted and versatile scorers and one of the league’s rising stars. In fairness, the fact that he was unable to arrive in timely fashion for his practice as a professional may have been something of a red flag, but at that age, few of us are aware of such things. Rider was selected fifth overall by the Timberwolves in the 1993 draft, and became an immediate impact player, averaging 16.6 ppg, 4 rpg and earned an All-Rookie First Team selection. He put up three 30-point games (all in December 1993) and scored 28 points on four other occasions. He recorded a season-high 32 in a December 17 win over the Clippers and produced maybe the best game of his rookie season with seasons highs of 32 points and 12 rebounds on December 30 against the Rockets. As much offensive potential as he showed as a rookie, his signature moment for the season (and perhaps of his entire career) came at All-Star Weekend. On his home court at the Target Center, Rider won the All-Star Slam Dunk Contest with a spectacular- and at-the-time-novel- between-the-legs jam, called the "East Bay Funk Dunk." In his sophomore season, 1994-95, Rider took his game to a new level, ranking in the NBA's top-20 in scoring at 20.4 ppg, 3.3 rpg and 3.3 apg. That season he victimized his hometown Golden State Warriors on a pair of occasions, logging the only two 40-point games of his career- 41 on February 7 at home and a career-high 42 on April 1 in his hometown of Oakland. Despite my nostalgic bias, I would remiss if I failed to mention Isaiah Rider’s numerous legal and disciplinary transgressions during his time with the Wolves. In December of his second season, Rider was suspended for conflicts with then-coach Bill Blair. The following season, he was arrested on one occasion for possession of both marijuana and an illegal cell phone. That same year, he was arrested for gambling in public in Oakland, as well as for kicking the female manager of a sports bar. Yeah, not a good guy. But the most talented, and for a brief moment the most accomplished, backcourt player in franchise history. There was another talented and qualified (perhaps more so?) candidate for this spot- Doug West. West was drafted by the Timberwolves prior to their inaugural season and spent nine seasons with the organization. While his career numbers with the Wolves are rather modest, West was an excellent on-the-ball and help defender and enjoyed a four-year scoring peak not far inferior to that of Isaiah Rider. During that stretch West averaged at least 12.9 ppg each season and posted a career-high 19.3 ppg in 1992-93. 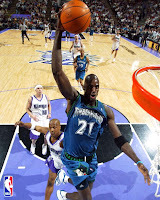 In 1995, West broke the Timberwolves’ all-time scoring mark, which had been held by Tony Campbell- Kevin Garnett has since lapped the field several times over. Doug West ranks first among guards in games played (609), points (6,216), offensive rebounds (505), defensive rebounds (1,054), total rebounds (1,559), blocks (169) and steals (428). West ranks in the top five in franchise history in games played (3rd), points (3rd), steals (3rd) and FG attempted and made (4th in each). Given the total lack of team success on neither man’s resume, individual measures decided this race. Thanks to a modest-but-productive prime and the accumulation of statistics as a result of longevity with the organization, Doug West ranks near the top of many all-time lists for the Timberwolves. However, based solely on their respective primes, Isaiah Rider is the best two-guard in Minnesota Timberwolves history. In what turned out to be a fairly competitive spot, the nod here goes to Tony Campbell, Minnesota’s starting small forward for the franchise’s first three seasons in the NBA. Campbell didn’t really get much of a chance during the first five years of his career with the Pistons and the Lakers, playing more than 800 minutes once (1,292 in 1985-86 with Detroit) and scoring in double figures just once (11 ppg in 13 games with 1987-88 Lakers). The Lakers left him unprotected for the 1989 expansion draft, and he was selected by the Minnesota Timberwolves. During his three seasons in Minnesota (particularly the first two), Campbell emerged as an excellent scorer. 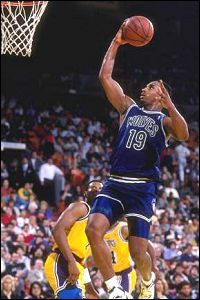 In 1989-90, the Timberwolves’ inaugural season, he played in all 82 of the team’s games and averaged 23.2 ppg and 5.5 rpg. He followed up his breakout season in 1990-91 with another outstanding campaign, in which he averaged 21.8 ppg, 4.5 rpg and 1.6 spg. Campbell added a third solid season in Minneapolis in 1991-92 (16.8 ppg, 3.7 rpg) before leaving the franchise in the summer of 1992. 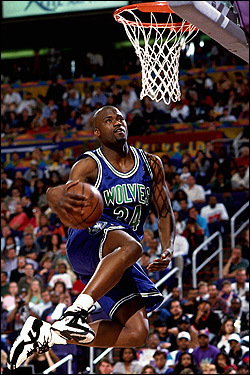 At the time, Campbell was the Timberwolves' all-time scoring leader, with 4,888 points. Campbell’s mark, surpassed by Doug West in 1994-95, is still good for fifth in franchise history. Also making a compelling case- arguably one deserving of this spot- is Wally Szczerbiak, who played in 436 games with the Timberwolves, over six and a half seasons. During that time, Szczerbiak averaged 15.5 ppg, 4.4 rpg and 3.4 apg. Wally was also named an all-Star in 2002, when he averaged 18.7- 4.8- 3.1. 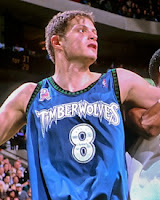 While the Timberwolves reached the playoffs in each of the first five seasons Wally was on the roster, Szczerbiak had difficulty staying healthy, missing 30 and 54 games respectively in the 2002-03 and 2003-04 seasons. These included the Timberwolves’ run to the Western Conference Finals, in 2003 -04, when Wally averaged just 10.2 ppg and 3.1 rpg in 28 regular season games and 11.8 ppg and 3.3 rpg in the postseason. On paper, Wally Szczerbiak’s credentials- five postseason trips and an All-Star selection- should trump those of Campbell. However, accounts of Szczerbiak’s selfishness (he would reportedly sometimes jump into passing lanes and steal passes intended for his own teammates) combined with the fact that Minnesota’s only trip past the first round of the playoffs came during his most injury-plagued season, and it become apparent that Szczerbiak’s true impact on the Timberwolves was not as great as one might think. Also, deserving of mention is Christian Laettner, Tony Campbell’s successor at small forward. Laettner averaged 17.2 ppg (including a career-high 18.2 ppg as a rookie in 1992-92) and 8.1 rpg in 276 games with the Timberwolves. Despite a solid scorig average and stronger rebounding numbers, Laettner falls more than 3 ppg short of Campbell, and actually enjoyed less team success in his three full seasons with the Timberwolves (60 total wins) than Campbell did in his three seasons (66 wins). One of the easiest selections in the entirety of this series. With regard to Tim Duncan I have said that few, if any, players in NBA history have meant more to a franchise than he’s meant to the San Antonio Spurs. The same can be said of Kevin Garnett during his time in Minnesota. The Timberwolves franchise had neither made the playoffs nor finished above .500 prior to Garnett’s arrival, and has to accomplish either feat since his departure. In between Garnett led the franchise to eight winning seasons, four seasons of 50+ wins and eight consecutive postseason appearances, including the 2004 Western Conference Finals, where the Wolves fell to the Lakers in six games. In addition to being responsible for any team success enjoyed by the Timberwolves, KG is the franchise’s all-time leader is virtually every statistical category. By a considerable margin (at least double, often considerably more, in each case), Garnett holds the top spot in Wolves’ history in games played (927), FG attempted (15,414), FG made (7,575), FT attempted (4,781), FT made (3,727), offensive rebounds (2,571), defensive rebounds (7,971), total rebounds (10,542), assists (4,146), steals (1,282) and blocked shots (1,576). KG also ranks as the only player in NBA history to average at least 20 ppg, 10 rpg, and 4 apg for nine consecutive seasons. (1998–2007), as well as the only player in history with career totals of at least 20,000 points, 11,000 rebounds, 4,000 assists, 1,200 steals, and 1,500 blocked shots. On a per game basis, KG ranks first in rebounding, second in scoring and blocks, sixth in steals and his 4.5 apg are good for eighth in franchise history. During his 12-year run, KG was named an All-Star ten times, All-NBA First Team three times, All-NBA Second Team three times and All Defensive First Team six times, while winning the 2004 league MVP and the 2003 All-Star MVP. While in Minnesota, Garnett led the NBA in rebounds per game four times: 2004 (13.9), 2005 (13.5), 2006 (12.7) and 2007 (12.8). Also, he’s the only player ever to lead the NBA in defensive rebounds for five consecutive seasons. Also worth of a mention here is the man for whom Garnett was ultimately “mercy traded”, Al Jefferson. Had he not been traded during the summer of 2010, Jefferson was poised to overcome a 2009 ACL tear and looked capable of mounting an assault on some, if not all of Garnett’s franchise marks. In 208 games with the Wolves, Jefferson averaged 20.1 ppg and 10.4 rpg, good for third and second, respectively, in franchise history. In his short run with the Wolves, Jefferson managed to crack the top four in franchise history in offensive, defensive and total rebounds, while ranking in the top ten in points scored with the franchise. Yeah, I said Rasho Nesterovic! Unfortunately for fans in the Twin Cities, the position of “center for the Timberwolves” is perhaps the weakest position in NBA history. There’s really not a whole lot to say here. Without ignoring the rules and calling Al Jefferson a center, the crop of “talent” to choose from in the middle is limited to Nesterovic, Sean Rooks (9.3 ppg, 5.3 rpg) and Mark Blount (11.6 ppg, 5.7). Despite higher per game averages, both Rooks and Blount played fewer than 130 games with Minnesota, and neither put up particularly impressive numbers or achieved anything of note with the franchise. While Nesterovic’s per game numbers are somewhat pedestrian, he’s a “destitute man’s KG” among centers in Minnesota. Nesterovic ranks first among Timberwolves’ centers in games played (316), points (2,355), offensive rebounds (583), defensive rebounds (1,128), total rebounds (1,711), assists (328), steals (130) and blocked shots (373). In 2002-03, he produced the best season of his career, averaging 11.2 ppg, 6.5 rpg and 1.5 bpg. Also, in his four full seasons with the Wolves (he played in just 2 games as a rookie in 1998-99), Nesterovic was a part of four playoff teams, each of whom won 47+ regular season games and three times reached 50+ wins.